100% Natural Brazilian carnauba-based wax. Proprietary blend of gloss enhancers and wetting agents. Replicates the wet shimmering glow of fresh ripe cherries. Makes any paint color glisten and shine with intensity. Protects against contamination, pollution, and harmful natural elements. Repels UV rays that fade and discolor paintwork. Shields paint, glass, clear plastic, and polished metals. 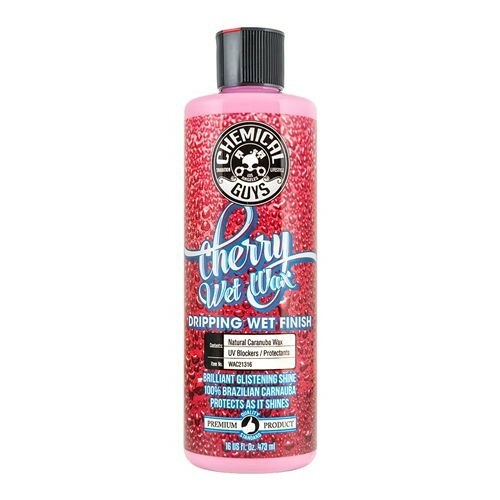 Chemical Guys Cherry Wet wax is back and shinier than ever! The fan-favorite natural carnauba cream wax makes any car glow with deep-wet radiance. When it comes to beauty and clarity, nature knows the best way, so Chemical Guys master blenders replicated the unique glistening glowing shine of ripe wild cherries. By blending natural Brazilian carnauba wax with proprietary gloss enhancers and wetting agents, Chemical Guys created a cream wax that makes any car shimmer deeply and glow intensely. Spread a coat of Cherry Wet wax over dark car colors to deepen the mysterious glow of black, blue, green, and gray paint. Brighten up light colors like red, orange, yellow, and white with intense radiance and warm glowing shine. Exaggerate the vibrant glittery shine of metallic painted finishes with a candy sparkle shine. natural carnauba wax is one of nature’s most durable protective coatings. Spread Cherry Wet wax to repel pollution, natural elements, and contamination from paintwork, glass, clear plastics, and polished metals on any automotive exterior. Cherry Wet wax is the perfect choice for a sizzling shine, intense glow, and durable protection on any painted finish. Find out why fans and detailers worldwide have been clamoring for the return of Cherry Wet wax for years, and see your car sparkle and shine like it never has before. Natural ingredients give the best results, so Chemical Guys blended Cherry Wet wax with all-natural Brazilian carnauba. Car enthusiasts and professional detailers have turned to Brazilian carnauba wax for its signature warm, wet, and lustrous shine for over 100 years. carnauba comes from a palm tree that grows in the rainforests of Brazil where this wax protects the fragile leaves of the plant from harsh UV sunlight. Nature knows how to make beautiful depth and brilliant shine best, so Chemical Guys only blends every bottle of Cherry Wet wax with pure carnauba. Chemical Guys is renowned for quality for a reason: there is simply no room for low-grade fillers or cheap paraffins in any product. Only real Brazilian carnauba is allowed in the highly-refined and high gloss Cherry Wet wax. 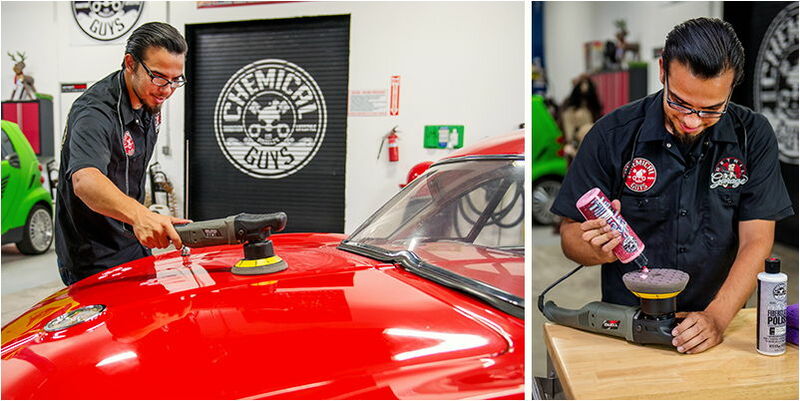 Chemical Guys maximizes and prolongs the brilliant glistening shine and protection of Cherry Wet wax with detergent-resistant polymers, so it isn’t washed away with normal car washing techniques. When professionals and enthusiasts want a warm, wet, and brilliant glistening carnauba shine, they choose Chemical Guys Cherry Wet wax. For years that has peaked our curiosity of bringing that perfect shimmer of shine to car paint in an easy to use wax that is both warm and wet. The perfect blend of carnauba warmth and durability blended with that dripping wet reflection of Cherry Wet wax is truly every show-goers must-have. From classic cars to newest and best, Cherry Wet wax delivers that exclusive cherry show shine. The elements do everything they can to destroy your car’s painted finish. UV sunlight, pollution, industrial fallout, bugs, birds, water, and abrasive dirt scratch paint, fade colors, and ruin shine on every paint color. 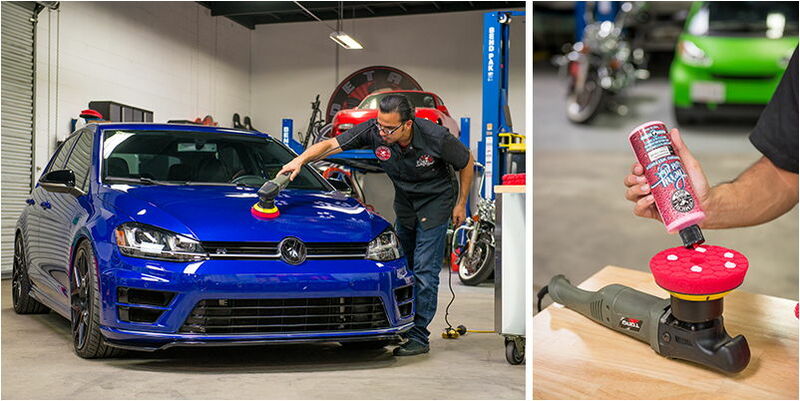 Chemical Guys Cherry Wet wax is a natural sealant waxthat protects as it shines. wax works by filling in the tiny microscopic pores of paintwork. Once the tiny peaks and valleys are smoothed over, dirt, debris, and water have a hard time sticking to the surface. carnauba wax is also nature’s sunscreen for plants, so the naturalprotectant shields paint from harsh UV sunlight that causes cracking and fading. Surfaces sealed with Cherry Wet wax look shiny and wet, and stay cleaner for longer since grime can’t stick to it so easily. And when it does come time for a normal car wash, the car is easier to wash and dry because the smooth surface rinses clean and doesn’t catch the towel. Spend a few minutes waxing your car with Cherry Wet wax at every full detail now, and save yourself from expensive paint jobs down the line. 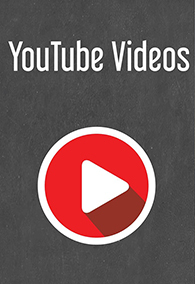 What use is a good product if it’s difficult or impossible to work with? Chemical Guys takes the time to ensure every product is as easy and intuitive to use for any detailing enthusiast or professional. For Cherry Wet wax, the application methods are simple: spread a thin, even coat by hand or machine one panel at a time. With Cherry Wet wax, the applications are limitless: spread the smooth cream wax over any exterior surface that is shiny or clear. Protect paintwork with a glistening wet shine; repel rainwater and washer fluid from windshield and windows; keep chrome and polished metal wheels and bumpers shining brilliantly with pure reflection. The possibilities are endless with Chemical Guys Cherry Wet wax! A thin coat is all you need. A thick layer has a lot of wax that doesn’t actually touch the paint. Anything that doesn’t touch paint is buffed off and wasted. Spread the thinnest coat possible to just cover the surface, and watch as one bottle of Cherry Wet wax covers dozens of cars from bumper to bumper. Wash car and decontaminate the surface with a clay bar. Shake Cherry Wet wax well. Spread a thin, even coat over the surface with a premium microfiber or foam applicator . For machine application, place 4 - 6 dots of Cherry Wet wax on a soft foam finishing pad (like Hex-Logic Black pad,) and spread it over the car one panel at a time. Never spread glaze, sealant, or wax with a rotary polisher.